Great for a cold day, whatever your definition of cold is. Comfort food is relative. It really depends on the person and the day. Sometimes I want etouffee, most day I’ll welcome a good bowl of Pho. There is always an on going debate about which is better, Pho Vs. Ramen. People change sides very often. After a day trip to Japan town in SF, my friends and I are really obsessed with Japanese food. Even though I’ve grown tired of sushi (send the hate mail), I will never get tired of good Japanese ingredients. I LOVE unagi. Best thing ever. I don’t know much about Japanese cuisine, so that’s why I avoid sushi and try something else. You know what udon noodles are great and often over looked. So Japanese dinner night here we go. 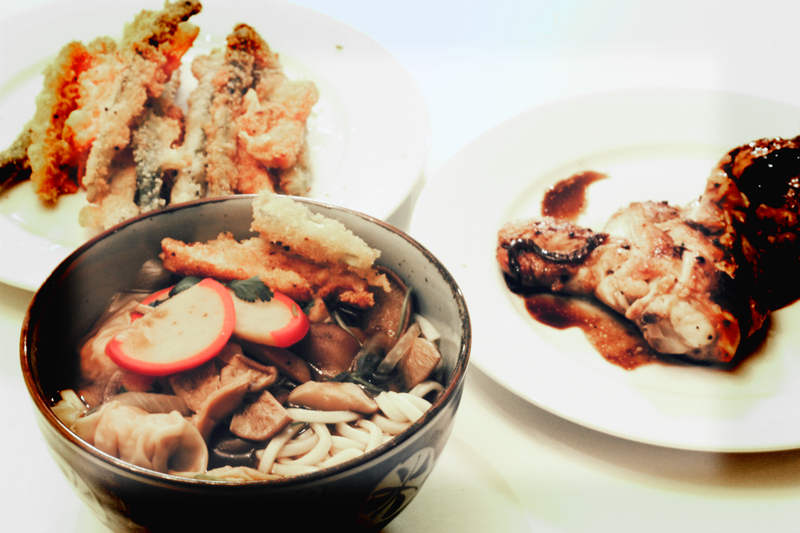 This post will only cover the udon noodles, I will cover the chicken teriyaki and tempura some other day. Let’s get to the REAL food. Warning, this serves about 5 people. I was cooking for 3.
Pepper and extra soy sauce. Soak the dried shitake mushrooms for at least 30 minutes in hot water. The longer the better. It’s probably going to take around 4 cups of water. I just eye balled it. Boil salted water and cook the udon like pasta, until it’s al dente. After rinse with cold water or soak in an ice bath to stop the cooking. Reserve and let’s start the broth. Drain the shitake mushrooms from the water. What you have left is basically mushroom broth. Easy isn’t? Pour that water gently into a heated pot, leaving the sediment on the bottom to discard (it’s really apparent). Then add 8 cups of water and the soy sauce, as well as the dashi. Then drop in the shitake mushrooms, onion, fish cakes, and cilantro. Bring it to a boil. And that’s basically it. No really, you’re done. All you have to do is taste for seasoning, using soy sauce and pepper to your preference. I’ll admit, it cook me three hours to make this set up for a party of 4. Was it worth it? Yes. Dinner seemed all you can eat. 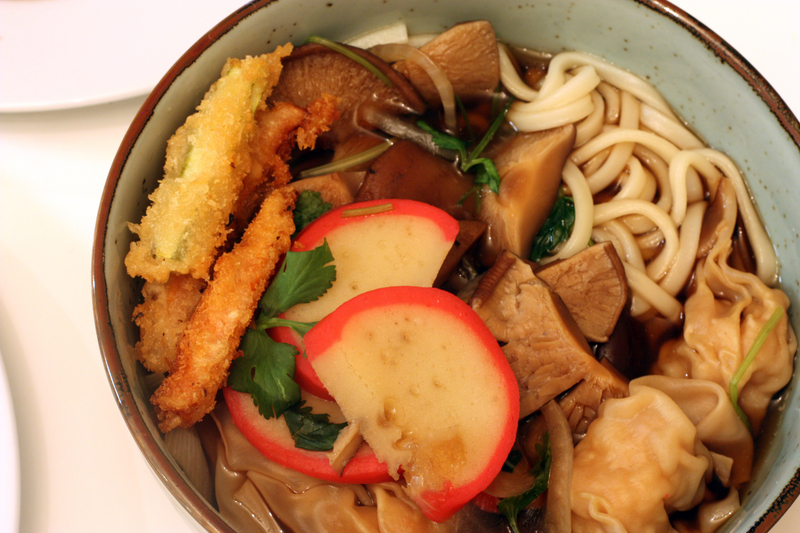 To plate, place a handful of udon noodles in a deep bowl. Throw in that awesome broth you made yourself to your preference. That broth is going to be boiling, so be careful. Let it cool for a couple of minutes so it can calm down and really get those flavors going. Super simple, I hope you guys enjoy this. It’s good for a cloud day, which is everyday in the Sunset. This entry was posted on August 21, 2012 by rrfoods in Chicken, Dinner, Fish, Lunch, Soup, Soup and tagged asparagus, broth, carrots, chicken, dashi, fish, japanese, noodles, panko, roast, soup, soy sauce, tempura, teriyaki, udon, vegetables, veggie.